The list of courses with Indigenous content is now available! 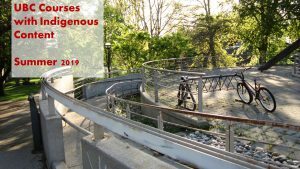 According to the 2019 University of British Columbia Course Calendar and departmental course descriptions, there are 25 courses, from 12 different departments, that have a significant amount of Indigenous content being offered for the Summer 2019 session. To download the course list click here. October 24th, 2017 by Lucinda Murray | Comments Off on Food for Fines! 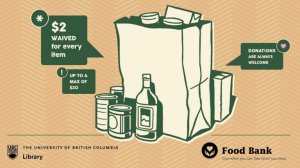 For the fifteenth year in a row, UBC Library and the Alma Mater Student Society are happy to be collaborating on the annual Food for Fines Campaign. From October 23rd to November 6th, you can pay off your fines through donating non-perishable food items at the Xwi7xwa Library desk and other branches across campus. Each food item is worth $2, and you can use your donations to pay for fines up to a maximum of $30. All donations go to the UBC AMS Food Bank and the Greater Vancouver Food Bank. To find out more about the initiative, visit the UBC Library website. Posted in annual-updates, carousel, food for fines, library fines, Xwi7xwa News | Comments Off on Food for Fines!